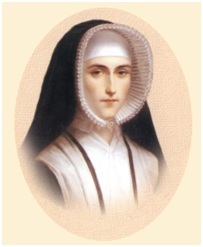 On this day in 1826, our congregation’s first leader, Josephine Potel, was buried and Mère Angelique Geay became the second Superior General of the Sisters of Bon Secours. We know from one of her letters that she advised, “Be simple.” And to her fellow Sisters: “Love one another.” Angelique Geay saw the Congregation spread through France. The Sisters became known for their dedication to Christ and devotion to the sick and suffering of all classes and religions.